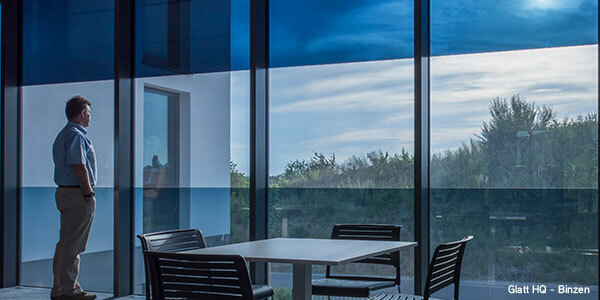 In a built environment, dynamic glass gives us a constant connection with nature, sunlight and the views around us. It reduces glare and heat, provides the perfect tint for the time of day and increases quality of life—in short, it transforms the experience of being indoors. Whether in the workplace, the classroom, a healthcare facility or cultural institution, a lack of daylight and connection to the outdoors can take its toll on the people spending time there. Workers without windows have trouble sleeping at night, which makes them less productive during the day. Occupants spending their days under harsh artificial light see a decline in both health and well-being—20% of the population suffers from mild SAD (seasonal affective disorder) due to lack of sunlight in certain seasons. And according to our 2016 Work Environment Survey, 87% of respondents would like to work near windows. Studies show that natural light leads to increased concentration, better memory, improved well-being, reduced stress levels and even enhanced creativity and clarity of thought. For architects, the use of daylighting opens up design possibilities for merging the outdoor and indoor worlds. And when you add the fact that workers near windows also report an extra 46 minutes of sleep per night (according to a report by the World Green Building Council), it’s clear the benefits of daylighting make it a crucial part of any building design process. Despite all the obvious advantages of daylighting, a space with too much sunlight can have its downfalls. It creates an energy-inefficient space, where excessive heat gain in the summer and heat loss in the winter lead to costly temperature regulation. For occupants, glare and added heat create discomfort when the sun is especially bright. In addition, the sun can harm interior materials and cause artwork and furniture to fade. So how do you reconcile the benefits and the problems of daylighting? This is where dynamic glass comes in: it allows for greater access to views and daylighting while blocking unwanted glare, heat, fading and harmful radiation. And with automatic controls that can block up to 99% of light, occupants can achieve the ideal optimization of light and comfort. Dynamic glass also creates a much more energy-efficient space and can help your building earn Green Credits such as LEED, BREEAM, HQE and more.